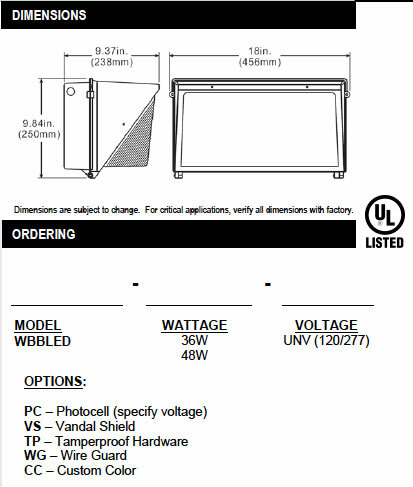 The WBBLED is available in 36W and 48W LED. 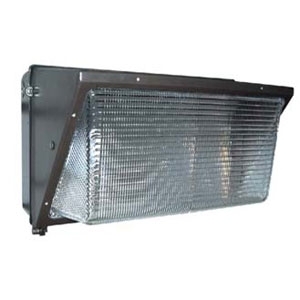 This unit features a die-cast aluminum housing with integral hinging feature for ease of maintenance. Borosilicate prismatic glass optically-designed for optimum light distribution. Optional polycarbonate shield or wire guard for vandalproof protection is available. Threaded apertures for conduit and optional photocell provided for flexibility during installation. A 36W LED is comparable to 125-150W HID. A 48W LED is comparable to 150-175W HID. High efficiency electronic constant current Class II 120/277V driver. Baked on premium architectural bronze for maximum durability. Custom colors available. Dimensions are subject to change. For critical applications, verify all dimensions with RLE.